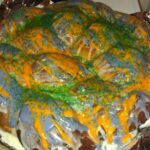 This year I decided I wanted to make a King Cake for Mardi Gras. Not that Alex and I do anything to celebrate Mardi Gras or give anything up afterward – it’s just a fun excuse to bake something delicious. 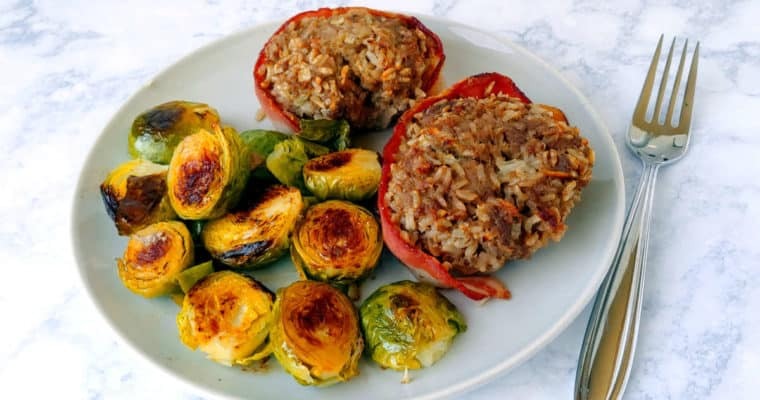 There are a few recipes out there that include fillings and such, but I decided to use this recipe, primarily because it seemed uncomplicated. (After all, it’s Sunday and I didn’t feel like making anything difficult.) I made this yeast-risen cake in my stand mixer, just like I do all other bread I make. I heated milk (2%) in the microwave and added it to sugar, a lot of yeast (2 tablespoons), and a little flour in the bowl of my stand mixer. I stirred it well and let the yeast proof while I prepped the rest of the ingredients (which consisted of melting 2 sticks of butter in the microwave and separating 5 egg yolks). The milk wasn’t too warm, so I added the egg yolks directly to the milk mixture and stirred (using the dough hook) on medium to mix/temper the eggs. I drizzled in the melted butter, vanilla, and 1/4 teaspoon lemon extract (instead of lemon zest). I added cinnamon and the rest of the flour. I wanted to add nutmeg, but I couldn’t find it in my kitchen. I kneaded the dough with the stand mixer on low for about 5 minutes, until it was smooth and elastic. This dough had enough butter in it that I didn’t need to grease the bowl I put it in to rise. The dough rose in a warm oven for about an hour to be nice and doubled in size. I weighed the dough into 3 equal pieces and rolled them out to equal lengths. (They might have been 16 inches in length, but I didn’t measure.) I braided the dough together. Starting in the middle of the strands, I brought the right strand over the middle, and then the left strand. Once done on that end, I returned to the middle and moved the right end under the middle, and then the left strand under the middle, until the dough was braided. I crimped the ends, and then transferred the braid to a pizza sheet where I turned the braid into a ring. I tried to seal the ends together, but it didn’t work very well. I covered the dough with plastic wrap and left it on the preheating oven to rise until it doubled again. 30 minutes later, the bread went into a 375F oven for about 25 minutes, at which point the bread was very browned. The cake smelled great as it baked – warm and cinnamony. I let it cool for about an hour before it was completely cooled. Frosting – I mixed together 2 cups powdered sugar, 4 tablespoons milk, and a little vanilla. (I should have used 3 because the frosting was runny.) I drizzled on most of the frosting, and reserved a little. I took half of the reserved frosting, added more powdered sugar to make it thicker for streaking, and added food coloring. I meant to go gold, but accidentally added a drop of red, which made the frosting very orange. I repeated the process to make purple, which turned a nice but not bright shade of purple. I streaked the colored frosting on the cake, and covered it with green sugar crystals. I did NOT hide any baby, bean, or trinket in my cake. The cake was a lot like a cinnamon bread or coffee cake with frosting. It had a light, flaky texture. 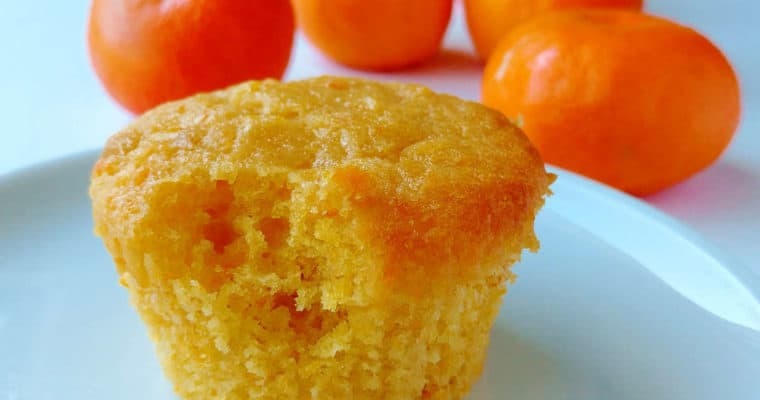 It was not particularly sweet if you had a bite without icing. It was lightly cinnamoned, but I had to try hard to notice the lemon extract I added. I think it would have been excellent had I been able to find my nutmeg. 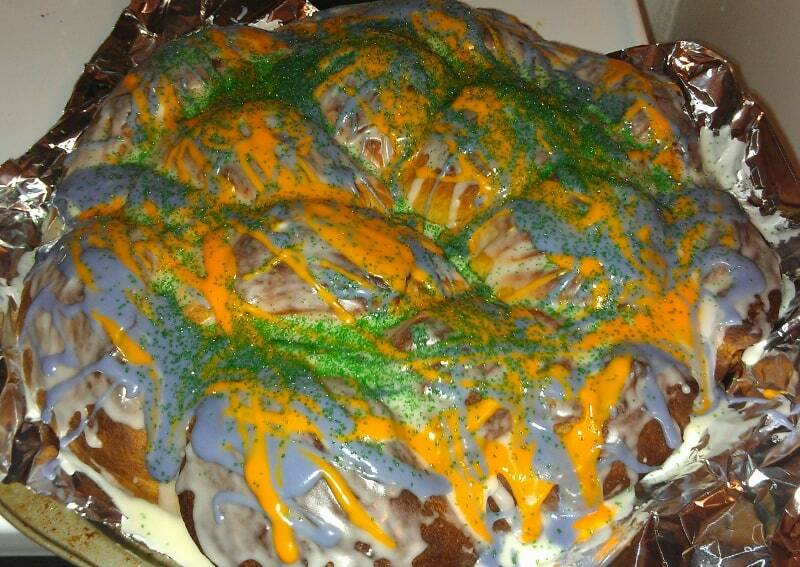 The King Cake was tasty, and much easier to make than the paczki I made last year. 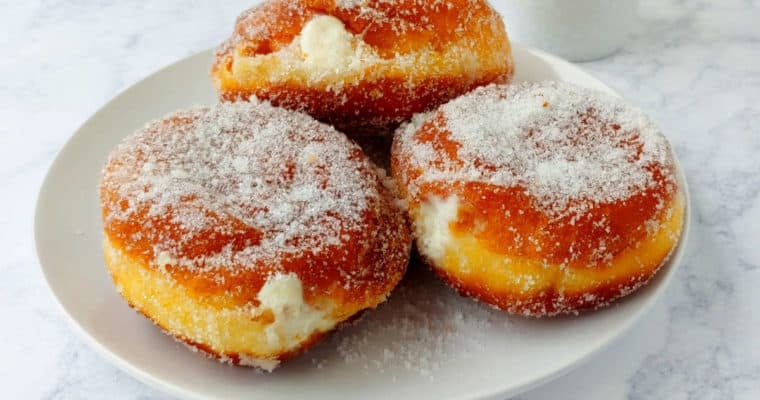 I want to say that I like the paczki better, but it may be more appropriate to say that they satisfy different sweet tooths – donuts versus coffee cake. 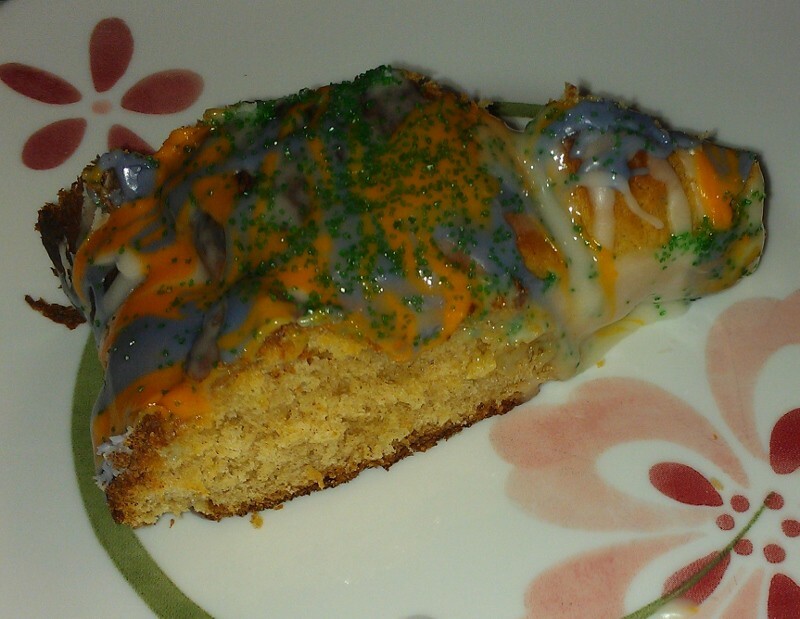 I think the King Cake makes a better presentation, and it definitely looks more festive. I’d never had King Cake before, and I have a feeling it will grow on me. 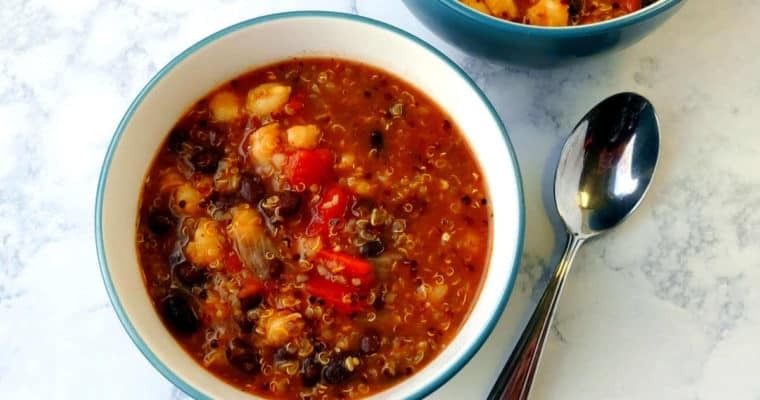 I bet I’ll begin to like it more and more as I eat it this week. In a large bowl (I used my stand mixer), combine sugar, yeast, and a tablespoon of flour with the milk. Mix until the sugar and yeast have dissolved. Let it rest for 5-10 minutes, until it becomes foamy. Whisk in butter, eggs, vanilla, and lemon zest. Add the rest of the flour, along with the cinnamon and nutmeg. Place dough in a bowl, cover with plastic wrap, and let rise for 90 minutes, until dough has doubled in volume. Divide risen dough into 3 equal pieces. Roll each piece of dough into a long strip; you want 3 ropes of equal length. Braid dough together, starting in the middle of the strands. Bring the right strand over the middle strand, and then bring the left strand over into the middle. Repeat until the end of the dough. Turn the braid around and bring the right end under the middle, and then the left one under, and repeat until dough is braided. Crimp the ends together to seal. Form braid into a ring and pinch the ends together. 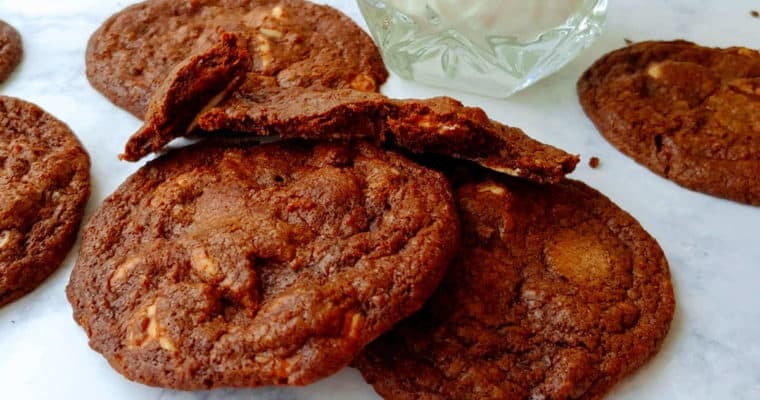 Place dough on a parchment-lined cookie sheet and cover with plastic wrap. Let rise until doubled in size, about 30 minutes. Remove plastic wrap and bake at 375F for 20-30 minutes, until golden brown. (Mine was done at 25.) Remove from oven and let cool for 30 minutes. Once it's doubled in size, place the cookie sheet in the oven and bake until the braid is golden brown, about 30 minutes. Remove the cake from the oven, place on a wire rack, and allow to cool for 30 minutes. Make icing while cake cools. Combine powdered sugar, milk, and vanilla and mix until smooth. Reserve some frosting to add food coloring to if desired. Spread icing over cooled cake and sprinkle with decorative sugars while icing is still wet. Hide bean or plastic baby under the cake, if using.